The easy to follow letter notes are included for recorder and flute players.Written by Frederick Weatherly and to the original tune of ''The Derry Air'' This song would be more popular with the Irish abroad than the Irish at home. The music notes are below. 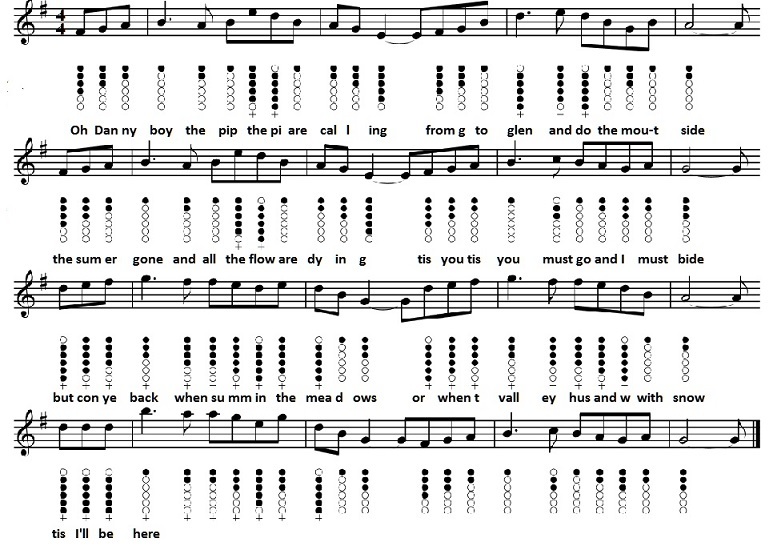 Danny Boy lyrics and chords There are other kinds of music on the site that's more suited to beginners of tin whistle where I include the words with the notes on top such as When The Saints Go Marching In . Danny boy would not be a great song if you are only starting to play as it goes very high into the second octave, but well worth learning anyway. Danny Boy and over 100 other songs are included in The Tin Whistle Songbook that I made especially for those who are learning how to play the whistle. All the songs have the basic letter notes just like the one on this page. Are some of the high notes a bit too noisy ?